Hello friends! Are you like me? Do you want to get in shape but just don’t know where to start? Do you get out of breath even thinking about going for a run? Let’s change that! I used to jog off and on in college and I really enjoyed it. I would go outside when the weather was nice, run around campus, go through my favorite park or neighborhood, and just enjoy some time with myself. And then I fell out of the habit and I have been having the hardest time getting back to it. I was back to square one and needed to start all over. I needed to learn how to run again! I made a little plan and wanted to share it with all of you! I just finished with it and am proud to say that I ran an entire mile WITHOUT STOPPING! It was not the fastest mile of my entire life, but I still did it and that’s all that matters! I printed this out and taped it to the inside of my front door so I could see it and not forget what day I was on. I love crossing things off a list, so this was kind of extra motivation for me! 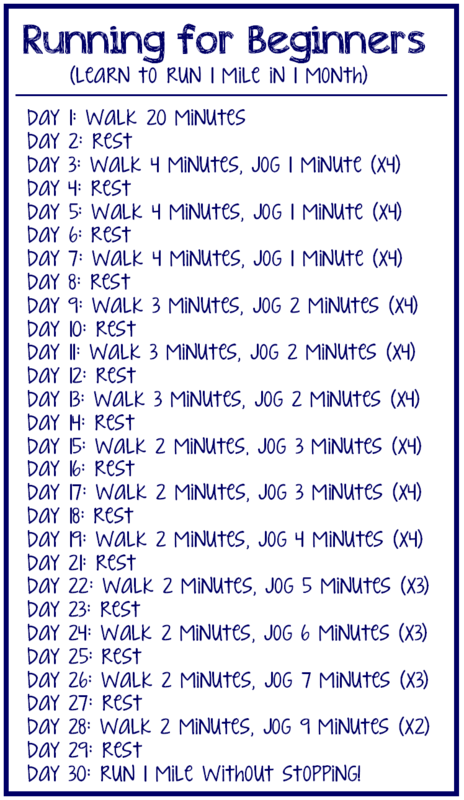 Give it a try and get moving while the weather is still nice! This is awesome! I love things like this as well! Such great motivation! I love this and I’m def printing this out. Thanks for sharing this! Couch to five k is also a really good app for this 🙂 I need to do yoga again my body needs it. Yes! I love C25K!!! I want to do it again soon! !